In the end, I decided to go forward. I decided to leave something behind. It’s been nine years in New Orleans, longer than I’ve lived in a city since I left home at 17. And in those two decades, there is no address I’ve claimed longer than the little cabin on Deslonde Street that served as my home for two years, one month, and twenty-seven days. I’m off the map again. Nothing new, really. I recently tried adding up all the moves I’ve made in my life and came to around 45. From the split houses that came with my parents’ divorce right through to the new life I formed after my own marriage collapsed; from my first shot outward when I went off to school, to the three schools that followed that first one; through ten states, a foreign country, and all the moves and all the dissembling and reassembling that came with them, the dominant theme of my life has been movement. And last week, once again, I moved. I loaded everything I own into a truck, drove to Florida, loaded it all into a storage locker, sold the truck, and took off to Mexico, where I now sit, calculating possible trajectories. There’s no way to write about what this move means for me without falling into overt sentimentality. Maybe that’s not the worst thing in the world. But I find I need to remind myself that this latest move isn’t about this house. It isn’t about New Orleans. It’s not a means of escape or a crisis of being. It’s simply an attempt, a hopeful and potentially misguided one, to embark on the life I want now. In nine years in the city, I learned to build a life from ground up, and to make it stick. I’ve never done that before, and the life I had at the cabin is the best evidence that it worked out the way I wanted. I wanted to live in this house years before it became my home. There was a time when if anyone asked me where I would choose if I could live in any house in the world, this would have been the place. That I felt that way and found a chance to make that feeling become a reality is still surprising to me. Some places we live in seem magical, and maybe there’s some truth to that. But I think the bulk of it is just finding a spot that syncs up perfectly with who and where we are in our lives, as though what was happening to us internally had manifested itself into the shape of a home. I’ve rarely lived anywhere that had so much of what I needed surrounding me all at the same moment. My favorite neighborhood. The Mississippi River just steps away. A good friend to share the space with. And music, all the time, pouring out of every wall. One of the many backyard concerts held at the house. When I tell people about my time here, years from now, it will come back to the music. I would lie down at night, and the music from the jazz band on the steamboat Natchez would drift across the water and sit in my room. My friends recorded single tracks and entire albums in the living room. The house was a living, breathing space where one person after another came to create their work, whether it be a new song breathed into a microphone and made permanent, or a campfire in the backyard where the songs welled up and held together in a shared space before floating away to make room for the next ones. One of the best parts about getting older is watching your friends become who they are going to be, and to find success with that. I’ve watched people who poured coffee and sang on the street when I first arrived become international touring musicians. I’ve watched friends publish their first books, their first stories. One after another, I’ve seen the people I know find their callings and begin to live them. A freighter passes outside my door on my last night in town. In a way, that’s what I’m trying to do now. Over the coming months I’ll be reworking the website and making moves for a massive trip that will consume the bulk of 2017. And I’ll continue to write, and to see how much further I can cast this net. I’ve been writing in the blog for a little over a year now, and it’s gone from a hobby to a cornerstone in what I hope will be the primary work I’m doing for years to come. I’m not done in New Orleans by any stretch. I’ll be back in town in a couple months, and I will be staying a couple months when I return. But I will be doing it without a fixed address or a room of my own. There are larger steps to come. But this was the first one. It feels big and it feels terrifying. I have nothing to complain about with the life I’m moving from. This house was a gift, and this house was ballast. It’ll be interesting to see how well I can keep my balance without it. Occupation: Attorney at Law, Tour Guide, Gentleman of Questionable Reputation. You can find him: Drinking an Abita Amber on Frenchman Street, Zydeco dancing in your neighborhood bar, wearing better clothes than you. For roughly three years, I lived around the corner from Jack Dempsey’s. It sat there on Poland Avenue, a little white cottage with no windows, no way to see if they were open unless you walked up and read the hours of operation. Over the years, I’ve found something comforting about the consistency of the place. New restaurants came in on Chartres and St. Claude. Another standby of mine, The Joint, moved a few blocks over from its concrete bunker on the other side of Poland Avenue. But Jack Dempsey’s simply sat there, marking time, always ready to receive me whenever I finally passed through its doors. It seems entirely appropriate that when I finally made my way there, it would be with my friend and fellow tour guide Keith Hurtt. Not just for proximity (he lives within a block of the place), but because few people seem to exemplify the staying power of the New Orleans character more than Keith. A lifelong resident of the city, a former attorney with a stint as a public defender on the city payroll, he seems to know every corner, every restaurant, every person on the street. I think of myself as a pretty sociable person, but Keith puts me to shame. A life moving through every strata of New Orleans society gives him the air of a man who has seen everything. He pops up seemingly everywhere in town, an Abita Amber conspicuously attached to his right hand. This town produces many great artists and musicians, and an overflow of brilliant cooks and corrupt public officials. But what New Orleans produces most readily, and most uniquely, is characters. The carriage driver with the laugh everyone knows. The homeless man on Jackson Square with the golf club. The fruit seller with the loudspeaker mounted on his pickup truck. Like signposts that read YOU ARE HERE, they move through the city, stitching it together with a thread of familiarity. Keith and I made for Jack Dempsey’s just before sunset. It’s a friendly place, with the low key air of a neighborhood sports bar. The waitress called us “sweetheart,” brought us a cold draft beer (for Keith) and a cold Barq’s root beer (for me), and a plate of onion rings roughly the size of Indianapolis. You should see the large order. You come to Jack Dempsey’s for steak and for seafood. 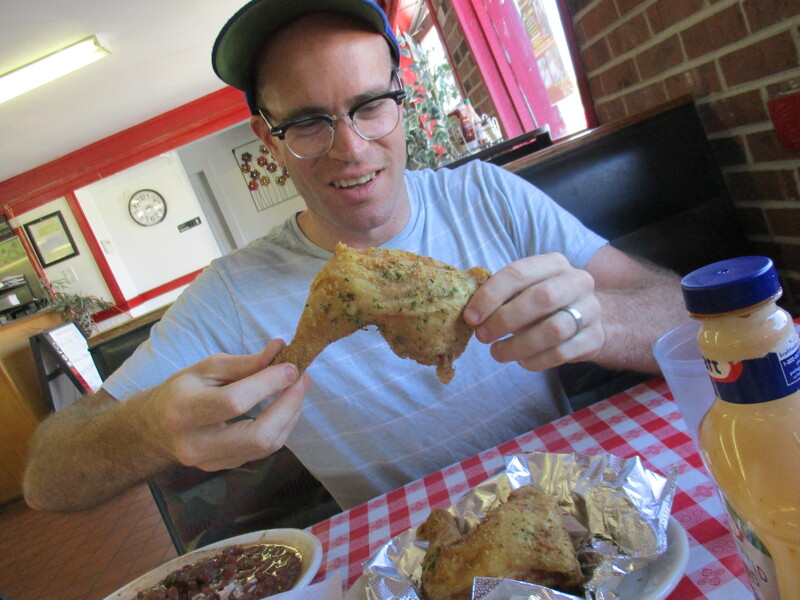 And if you’re really serious like me, you go for the half and half: a choice of two dishes—shrimp, oysters, frog legs, soft shell crab, catfish, redfish—along with a side. I went for the frog legs and shrimp and mac and cheese. Keith opted for the oyster po- boy. The portions are massive, and you should get your conversation in early, because it’s going to be nap time by the time you finish. Keith and I have been working together for over two years, but like a lot of people I know in New Orleans, getting to know him has been a process. Not because either one of us lacks a desire to communicate, but because New Orleans presents such an abundance of options in company, food, entertainment, and all the rest of it. It can be hard to connect regularly with everyone you want to connect with, and it’s usually an unexpected encounter that allows you to finally get to know someone you have known as an acquaintance for years. Perhaps that’s why it’s so special when you finally start to feel like a fixture in this city. When you can walk down the street and people call out to you, specifically you, in this sea of excess, this always transient population, it makes you feel you’ve stumbled on the keys to the kingdom. When the Dixie Brewery shut down after Hurricane Katrina, Keith hunted down every bar that had an available bottle of his favorite beverage. Bars began saving their final Dixie Beer specifically for him. In an article published in the Gambit in 2007, Keith talks about the waiter at the Napoleon House who raced across the room to bring him the last bottle of beer everyone thought was gone for good. You’re in a special place when things like that happen to you. Staying power means a lot in this town. As history sweeps over this city, the places and people that stake their claim to the territory, come hell or high water, demand respect. We’re not going anywhere, they seem to say. We’ll be right here, even if it takes you half your life to find us. Jack Dempsey’s is located at 738 Poland Avenue. They are open on Tuesday from 11 a.m. til 2 p.m., Wednesdays and Thursday from 11-8, Friday from 11-9, and Saturday from noon til 9 p.m. They are closed on Sundays and Mondays. Deal with it. They have a website here, and a Facebook page here. The Bonnet Carre Spillway diverting excess water from the swollen Mississippi River. There are many cars pulled up in the parking area when I arrive, everyone coming to see this mile and a half long structure designed to save us all from the wrath of the river. On one side of the spillway, a cargo ship labors upriver, fighting the massive flow going against it. On the other side, water pours through in dozens of cascades, easing the pressure on the rest of the levee system by strategically flooding another part of it. There’s a light rain coming down, and a few members of the Army Corps of Engineers sit under a tent in front of the spillway gates, talking to anyone who wants to know a little bit about what’s going on. In my neighborhood, the river is high. Higher than any of us have seen it in almost five years. We’re at flood stage in the city of New Orleans, and for the third time in the last nine years the gates of the Bonnet Carre Spillway are open. Water flows through the gates and, with the aid of guide levees, makes its way into Lake Pontchartrain. There are a whole other set of environmental concerns that come with diverting sediment laden river water into the waters of the lake, but those concerns will have to wait. Right now, the city is in danger. Maybe danger is too strong a word. But there have been massive storms in the central and northern United States this winter, and that water eventually makes its way here. Flood control is a major issue on the Lower Mississippi, and to make sure the city that houses the nation’s second largest port doesn’t get devastated by flooding, the Bonnet Carre Spillway was designed to keep things level. It was designed because, in 1927, everything went to Hell. No one had ever seen weather like it before. In 1926, a series of massive storms pelted huge swaths of the country, swelling rivers and flooding cities. Pittsburgh, Cincinnati and Nashville flooded. Dry farmland on the Great Plains flooded. There were flood-related deaths from Virginia to Oklahoma. By early 1927, water from the swollen Missouri, Ohio and Tennessee Rivers poured into the already high Mississippi River. Things were already near their breaking point when the snow from the northern states began to melt, feeding even more water into the river that serves as the main artery of the United States. And still more rains came. In the spring of 1927, four storms bigger than any in the previous decade hit the Mississippi River in succession. There was nowhere else for the water to go but out, and the resulting cataclysm would change the face of the country. At Mounds Landing, near Greenville, Mississippi, hundreds of men, nearly all of them black, were forced to work through the night of April 20, held there at gunpoint by white levee guards as the river continued to rise. Over the course of the night men could feel the ground beginning to rumble beneath their feet, and on the morning of April 21, the levee crumbled and gave way. Water smashed through with a force greater than that of Niagara Falls. Hundreds of men were swept to their deaths, and the town of Greenville was nearly wiped off the map. The breaches continued throughout the spring. In some places, flooding from the river created a body of water more than 70 miles across and over 100 feet deep. An area the size of New England was under water. The floods didn’t recede until that August, four months after the break at Mounds Landing. It was the largest natural disaster in American history, displacing over 600,000 people, and affecting the homes of more than a million. More than 300,000 people had to be rescued by boat from rooftops, trees, and anything else that stayed above the floodline. And if you ask anyone in this country about it today, few, if any, have ever even heard of it. In his book Rising Tide, a masterful recounting of the 1927 Mississippi River Flood, author John M. Barry breaks down the number of ways the flood reshaped the American landscape. First of all, it catapulted the country’s relatively unknown Secretary of Commerce, Herbert Hoover (who had been placed in charge of the relief effort) to the presidency. Secondly, it served as the first wedge between African-American voters and the Republican Party, which had counted on their support since the days of Lincoln. Appalling treatment of black citizens throughout the south was rampant during the disaster, and relief aid intended for them was often diverted to local white landowners. In Greenville, Mississippi, where the most catastrophic flooding occurred, local landowners refused to allow the evacuation of black citizens from pitifully stocked aid camps, fearing that they would never return to work the land they owned. As evidence of the mistreatment of African Americans in Republican controlled states became more widely seen, many black voters began switching their allegiance to the Democrats, which would help propel Franklin Roosevelt to the presidency and the Democrats to complete control of the congress in 1932. Third, the disaster reshaped the federal government’s role not only in response to such disasters, but also their role in protecting citizens from future ones. In 1928, the Flood Control Act was passed. It was the largest public appropriations act ever passed in the United States. It allowed the government, and specifically the Army Corps of Engineers, vast authority to monitor, regulate, and maintain flood control on the Mississippi and its various tributaries, from massive rivers like the Ohio and the Missouri, to smaller ones downstream like the Yazoo. It also allowed them to start work on major diversion projects like the Bonnet Carre Spillway and the Morganza Spillway, which have served to prevent massive flooding in the city of New Orleans. That last part might sound a bit dull and bureaucratic, and it would be if you didn’t consider the high price that was paid just down the river from New Orleans in the 1927 flood. As the water rose, a group of prominent New Orleans businessmen decided that the best course of action to save the city would be to blow up the levee below them and let the water drain out into the poorer, less populated St. Bernard and Plaquemines Parishes. After making assurances that all those in the path of the flooding would be fairly compensated, the levee was dynamited in Caernarvon, Louisiana, causing widespread destruction of the parishes downriver. As it turned out, the dynamiting of the levee was completely unnecessary. Breaches upstream were already siphoning water out of the river. As for the people in St. Bernard and Plaquemines Parishes, few were ever compensated for their losses. Those who were compensated received far less than they deserved, and their stories were largely lost to history. The danger in 2016 is nothing like 1927. The river is high, and flooding presents a challenge, but we’re still far enough away from the time of the great northern snow melts that everyone in New Orleans can remain cautiously optimistic about the coming year. That wasn’t the case in 2011. I moved to the Lower Ninth Ward of New Orleans in the spring of 2011, and shortly after my move the river began to rise. When the river reached flood stage in the city, the Bonnet Carre Spillway was opened. We kept hearing the reports from upriver. Flooding in Arkansas. Flooding in Missouri. Water in the streets of Memphis. But it couldn’t happen here, could it? When the water crested at record flood levels in Vicksburg and Natchez, Mississippi, it became obvious that New Orleans was facing real danger. When the full opening of every gate in the Bonnet Carre Spillway wasn’t enough, the Army Corps of Engineers made the decision to open the Morganza Spillway for the first time in 37 years. The Morganza Spillway structure was completed in 1954, and its purpose is to divert excess water into the Atchafalaya River Basin. This is a very, very risky proposition. Over the centuries, the Mississippi has steadily been moving in the direction of the Atchafalaya River, which offers a much quicker route to the Gulf of Mexico than the river’s current channel. In short, without the current levee system, the river probably would have moved over the top of the Atchafalaya by now. That means that, if the Corps of Engineers miscalculated the amount of water that they spilled through the Morganza, or if the heavy rains overwhelmed it, the entire course of the river could have changed. The Mississippi could have jumped its banks, started flowing down the Atchafalaya, and New Orleans would no longer be sitting on the main branch of the Mississippi River. Mike Park, Chief of Operations Division of the Army Corps of Engineers, speaks to a crowd during the 2016 flood event. The Corps of Engineers opened the first gate of the Morganza on May 18, 2011. For the next couple of weeks, with the river raging at its highest levels in 84 years, the people of New Orleans held their breath. We would either be flooded out, we would lose our river, or we would be just fine. For a few days, the mayor hovered over an evacuation order for the Lower Ninth Ward. I started putting things I owned onto high shelves. I don’t know why. If the river broke through that levee, not much of the house I was in would have been left behind. In the end, the flood control worked. The city was spared, the river returned to normal levels, and everyone came home, aware that we’d dodged a bullet, and not thinking about the next one. The Mississippi near flood stage in New Orleans on January 12, 2015. Today, things are calmer. The Bonnet Carre Spillway remains open, but there seems little danger of the water getting any higher before the spring snowmelt hits the Lower Mississippi. For the past three weeks, residents of New Orleans have made their way onto the levees to marvel at the power of this body of water that serves as the city’s lifeline, as well as one of its greatest threats. Like the rest of the world, we are dependent on nature for our livelihood, and like much of the world, we completely forget about this until that livelihood is threatened. But the river keeps rolling along, indifferent to those needs and desires. It will continue to provide for the city until, perhaps one day, it decides not to. It happened in 1927. It happened in 2011. We depend on engineering to make an accommodation with the river. And when those accommodations are threatened, we hold our breath and wait. As of January, 2016, the city and the river continue to hold their course. You can find her: At a gallery opening showing her work, hunched over her work desk and working harder than you. You can find him: On tour in Europe, playing on the streets of New Orleans, standing around wherever fine washboards are sold. I used to come here years ago, before its current incarnation. In 2007, this place was called Coffea, and it was the first neighborhood spot at which I was a regular. I came occasionally to write, but usually because it was a cheap, rather remarkable breakfast (five bucks for a stack of perfect sweet potato pancakes) and damn near everyone in the neighborhood showed up over the course of the day. I still don’t know why it took the changeover in ownership before it became widely recognized by people from outside the city. Maybe it was just a matter of timing. In 2009, the new owners took over, added in a juice bar, renamed the place Satsuma, kept the interior pretty much the same, and became popular enough that they were able to open a second location uptown on Maple Street. And the place is still fantastic. I still go there regularly. But what I will always remember best were those first couple years, and opening my 30th birthday with those sweet potato pancakes before I happened upon a wedding reception where the groom piled me up with fresh oysters and jambalaya like I was the one who was getting hitched. Today, Satsuma is a regular stop for both locals and tourists. It gets written up in the guidebooks as an example of the culinary scene of the Bywater neighborhood, and on Sundays the line usually extends out the door. The place has been successful enough that they’ve expanded not just to the uptown location, but to another juice/coffeehouse/bakery location in the Warehouse District called Pulp and Grind. Business, it’s fair to say, is booming. Green Eggs and Ham. Shaved ham and basil-pesto-eggs with onion and Swiss Cheese on a croissant. Sam I Am would be impressed. I met up with two of my closest friends for breakfast here. Robin Rapuzzi was recently back from yet another tour with his band Tuba Skinny, one of the many bands he plays with. Like most musicians in New Orleans, he wears a wide assortment of hats. He can be seeing playing drums with a number of bands, everything from Calypso and Klezmer music to rhythm and blues. But he’s best known around town for his off the wall washboard routines, which are half Washboard Sam and half Charlie Chaplin. A few years ago, Robin met a lovely Swedish comic book artist by the name of Magda Boreysza. There’s a tendency to be protective of your friends when they bring around someone they’re crazy about. You don’t want them throwing their lot in with somebody who won’t appreciate what makes them special. Robin’s a rare bird, and the kind of gentle individual you fear will be taken advantage of. But it was apparent immediately what a wonderful match Magda was for him. Not just in her kindness and her loyalty, but in the fierceness of her dedication to what they are building together. There’s a bad tendency to talk about artists as flighty creatures, prone to talking about their work more than they actually do any work (a category I have definitely fallen into at various times). What separates Robin and Magda is how completely they absorb themselves in the things they create. I’ve seen few musicians who work harder or keep their ears open wider than Robin, and I’ve seen few artists of any kind who work harder than Magda. And I think this dedication to their individual work is a big part of what fuels their marriage. It might seem incongruous that a focus on one’s own creativity could be such good fuel for connection with another person. This culture is full of stories of people who burned themselves out so completely at the office that they couldn’t give any attention to the people who loved them. Artists are no exception, as I’ve seen plenty who existed beautifully within the world of their creativity and stumbled mightily when it came to extending beyond themselves. But sometimes you meet people who have learned to strike the right balance, not only in allowing themselves the time and space to build their own work, but giving their partner the room to grow their own talents. I doubt Robin and Magda did this automatically. It’s a balance, I’m certain, that they have to work at. But work they do, and in a city of transient artists, polyamorous dreamers, charming con-artists and charmless drifters, they have managed to build a beautiful marriage, in the truest sense of that term. Of their lives. Of themselves. Of their work. And all of it is work of the best kind. You can see more of Magda Boreysza’s art at her website, Fox and Comet, which is located here. Robin’s work with Tuba Skinny can be seen all over Youtube and heard on their many albums. Their website is right here. Satsuma int he Bywater is located at 3218 Dauphine Street. They are open every day from 7:00 a.m. to 5:00 p.m. Their website is here. When I came home, nothing went right. New Orleans does that to me. I’ve lived in cities that welcomed me with open arms after some time away. New Orleans is not one of those cities. We develop relationships with the places we live, and my relationship with this city has always been that of a volcanic and potentially doomed love affair. New Orleans is my girl. She is generous beyond words. She has a vicious temper. And when I come home after a few months on the road, she invariably makes me sleep on the couch. And in this case, the couch had fleas. It’s every traveler’s nightmare. To come home from a beautiful, difficult sojourn and find that your nest has been fouled. This took many forms for me. My refrigerator was full of rotten food and the house had been infested with tiny had bloodsucking agents of the apocalypse that swarmed my ankles and bit me to hell. The transmission on my truck was leaking so much fluid I couldn’t go a day without replacing it. My skin broke out. The money disappeared. And then I started working with the first major wave of the tourist season bringing me regular six-day work weeks as I tried to right the ship. But the ship still floats, and my life in New Orleans has returned to something as close to normal as this town ever gets. My house is beautiful and free from pests. My truck runs better than a 25 year-old vehicle has a right to. The madness of the tourist trade is about to give way to a dead spell where I can celebrate Thanksgiving and curl up next to the space heater in my drafty room and try to point my way toward growing this blog. In all the traveling I’ve done in my life, I’ve rarely kept a journal. What’s shocking to me, coming back after months on the road and reading through what I’ve written, is how much of the trip I’d already forgotten. Travel is often overwhelming, and some of the smaller moments, while they may lodge permanently in our bones, have a tendency to slip away through the cracks in our memories, crowded out by the moments we’ve built into stories. What’s been even more valuable to me is the photographs, only a fraction of which I’ve shared on this site. Photographs, for me, serve primarily as writing prompts. But now, going through them, I see them for the first time as tiny memory capsules, each one bringing something I’d forgotten about back to the fore in vivid detail. I’m happy with the amount I wrote about the trip, but it’s surprising to me just how much I left out. It’s a cascade when I let it go. The strange and wonderful brownies at the Peg House in Northern California. Shooting pool with my old friend Ayinde Russell in Denver. Happening on Buddy Wakefield in Boulder and drinking tea in a tea house that was shipped over, piece by piece, from Tajikistan. The astonishing hospitality of Charlotte and Cindy in Oakland, and my cousin Mike the Judge in Hawaii. And the probably-best-left-unfilmed tour of Honolulu dive bars with Tui Scanlan, which had us staggering into an all night diner for pancakes drenched in coconut syrup and a metric ton of greasy breakfast favorites. A lot of bad decisions led to this moment. There was the horse farm in Michigan, where Karrie takes care of a number of equines, who in turn take care of her. There was the motorcycle rally in New Mexico, packed full of tricked out cafe racers, where John the Brewer took his bike for a fifty mile ride through the rich, red country north of Albuquerque. There was the re-connection with Rachel and her daughter Adele, who I’ve known almost since birth, just days after I held my brand new niece in a Chicago hospital. It all comes back in pieces, or it all come back at once, and I’m staggered by my own luck. To have stepped out into this kind of a journey, to have been taught more than I could absorb (though I tried to grab it all), and to have the privilege of planning the next one. Sometimes, if we’re honest with ourselves, it’s hard to accept that we deserve the good things that keep falling into our lives. I question it all the time. Whatever I’ve done to work my way into this existence, it’s still an accident of birth that I get to live this life. But it’s the one I have, and few things make me more grateful for it than this kind of journey. There will be more journeys to come, and more frequent updates. I appreciate all of you who have followed me so far. Keep following. 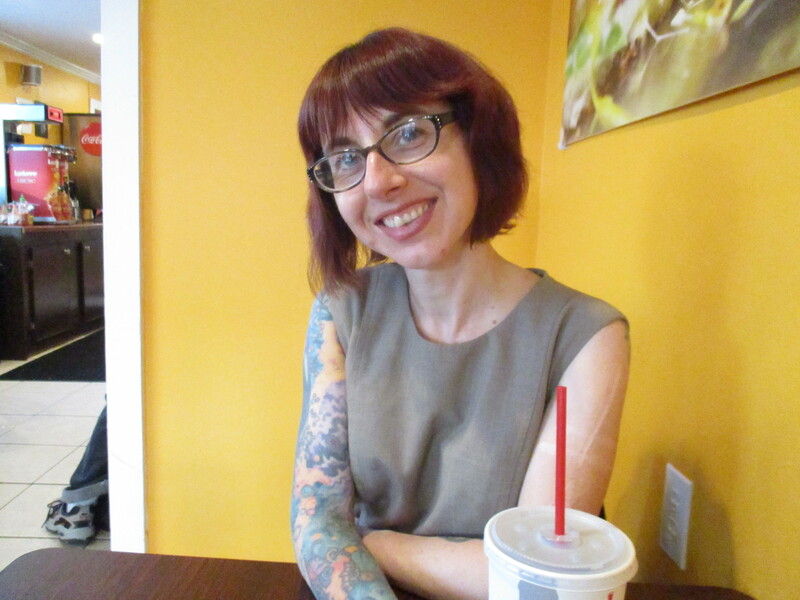 You can find her: Scanning the book she recommended to you at the library, curled around a book of poems, blowing your mind with her tattoos. I always feel a mad rush to see everyone I know and everything I love before I leave town. Maybe part of me doesn’t quite believe I’m coming back. But there’s a feeling of finality that makes me crave comfort food. And for me, that usually means ice cream. For my friend Izzy, however, that means gooey cheesy things, and a few months back someone came up with the bright idea of building a grilled-cheese-centric sandwich shop called The Big Cheezy right next to the law enforcement corridor at Broad and Tulane. Because you need this after traffic court. 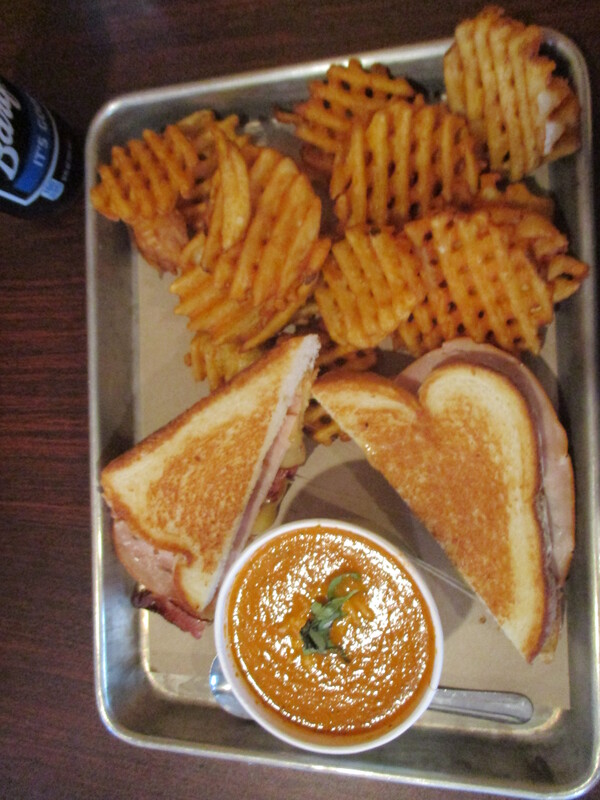 The Flying Dutchman: Melted gouda and smoked turkey with a side of waffle fries and tomato soup. Enjoy, Your Honor. It’s a tiny little spot, this one, but it packs in good value. Izzy and I both went for the Flying Dutchman, though the Big Cheezy, with three different cheeses on Hawaiian sweet bread almost had me. The room is small, and adorned with photos of grilled cheese sandwiches in various states of meltiness. There comes a time when a New Orleans restaurant passes from “local eatery” to “institution.” I’m not sure when it is, but all the places in the latter category have to start somewhere. Big Cheezy is just getting started, but you can’t help but notice that they already have some of the marks of a New Orleans staple: a good, simple menu of things they do extremely well, again and again, and a classic bit of comfort food that they cater to exclusively. If you want a grilled cheese sandwich, where are you going to go except the place that specializes in them. You do one thing better than anyone else, and people will keep coming back for it. 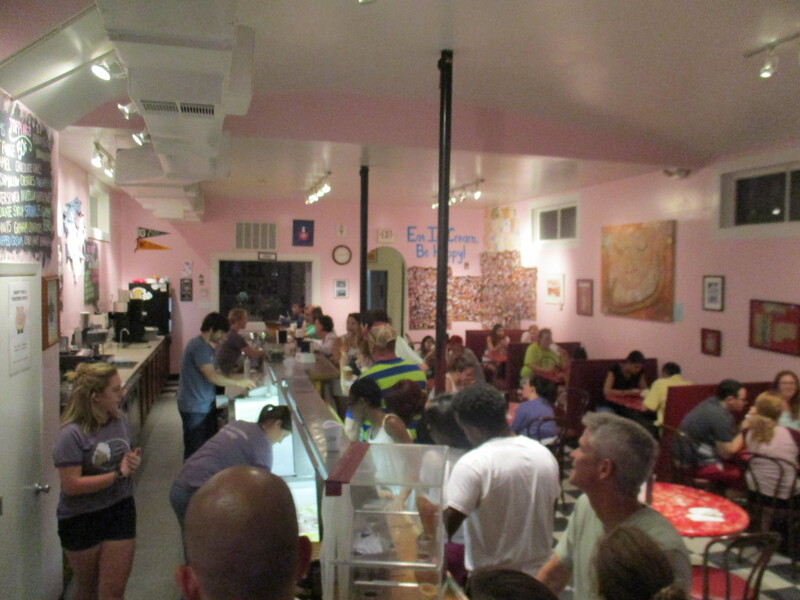 Which is why, after dinner, we went to the Creole Creamery. This is a great town for desserts. Pastries. Cannolis. Bananas Foster was invented here. But if nothing will do but ice cream, I usually find myself on Prytania Street for a couple scoops from the Creole Creamery. 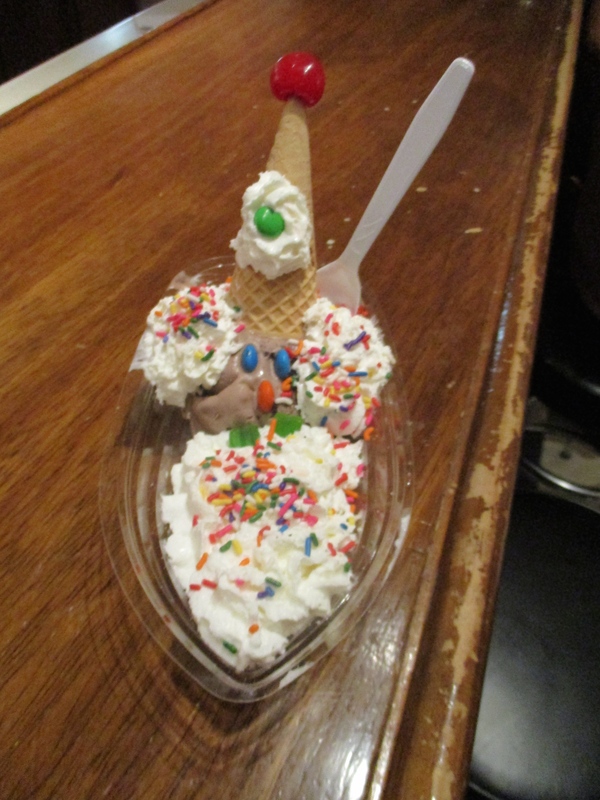 Or you can just get a sundae shaped like a clown, because why not? The walls are pink pastel and you turn into a kid instantly when you wait in line. I rarely order more than I can finish, but I usually order more than I should finish. Izzy and I took a seat at the counter on the far end and ate our sundaes and talked about the coming year. We came to new Orleans at almost exactly the same time, we’ve both moved away for a bit, we both came back. We’ve both put a wringer of a year behind us, and the one to come is feeling more and more like a gift. For her, there’s the library, the comfort of her own space, and a deeper understanding of the city. For me, there’s the road, and the certainty that a bit of clarity will come from letting the kid in me out to play. We have faith in these things, and that’s important. Summers are hard in New Orleans. We take comfort where we can find it. 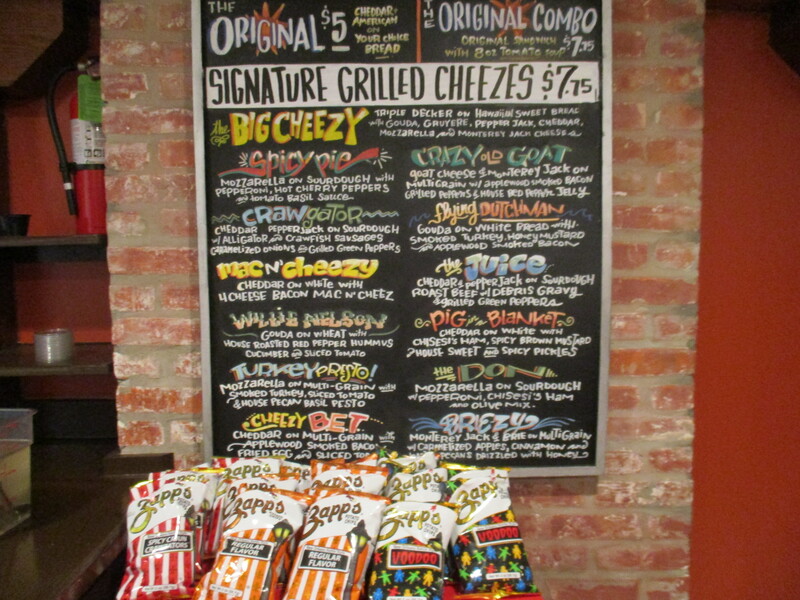 The Big Cheezy is located at 422 1/2 S. Broad Street, just off Tulane Avenue. They are open 11 a.m. to 9 p.m. seven days a week. They have a website here, and a twitter page here and a facebook here. The Creole Creamery has locations at 4924 Prytania Street (noon to 10 p.m. on Sunday thru Thursday, noon to 11 p.m. on Friday and Saturday) and 6260 Vicksburg St in Lakeview (2-9 p.m. Monday thru Thursday, 2-10 p.m. on the weekends). They have a website here, a twitter here and a facebook here. You can find him: Playing trombone at Preservation Hall, playing trombone on Frenchman Street, playing trombone in Europe, collecting hats. Four years. Has it really been four years since Charlie and I did this? It used to be a regular thing. 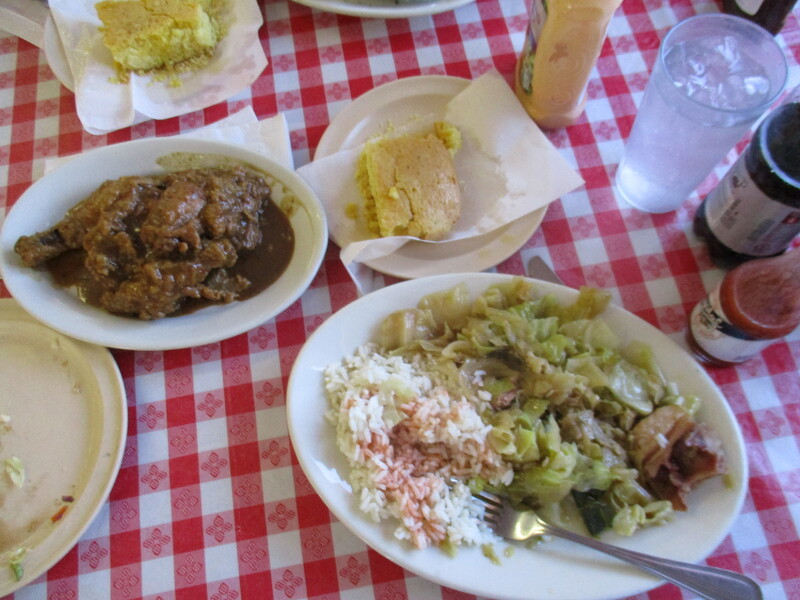 We’d hop on our bikes and head to Two Sisters over on Derbigny Street, just in back of St. Louis Cemetery #2, order up enough food to feed a small army, and talk about lives. More specifically, we’d talk about women, which were often the focus of our lives. But for a variety of reasons, we hadn’t done one of our lunch excursions in a while. A long while. I’d spent a couple summers out of town, and Charlie, God bless him, got married to a lovely woman named Mia. 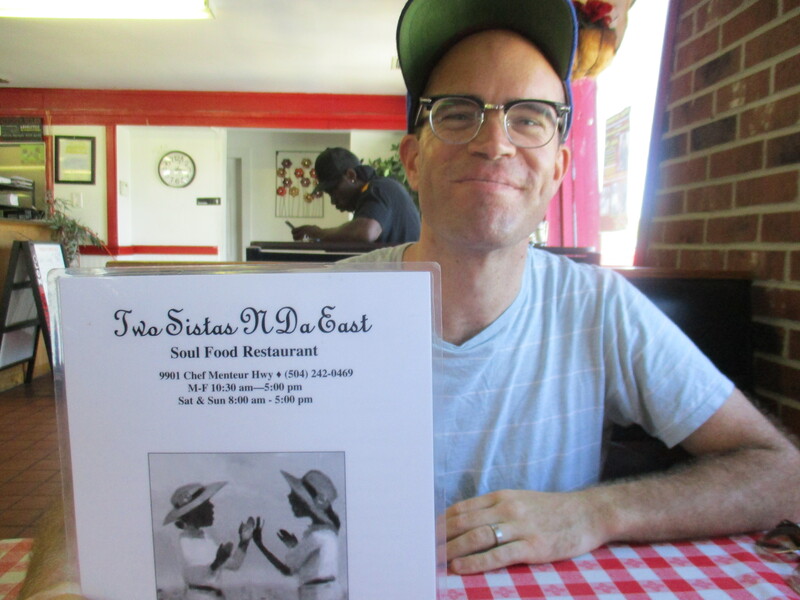 But when I started writing this series, I made it a top priority to grab Charlie and get out to visit Two Sisters restaurant like we used to. 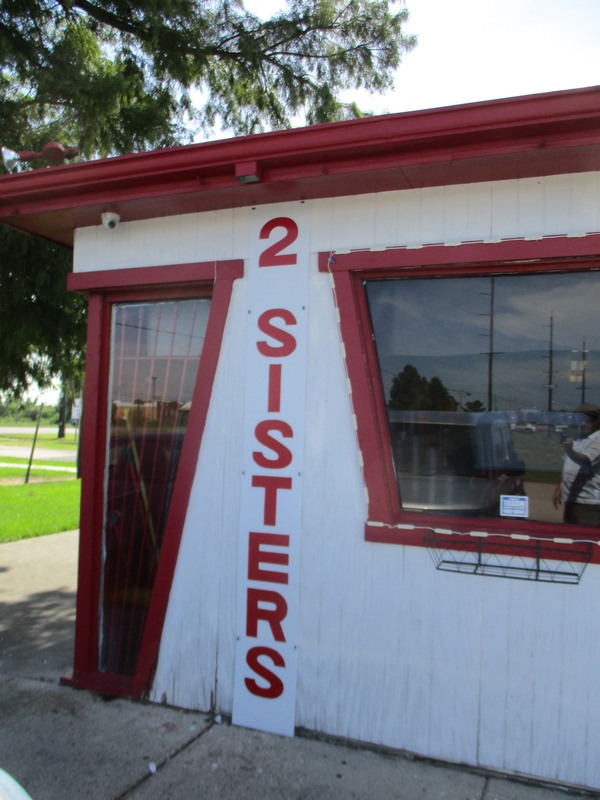 There was one problem: Two Sisters is closed. Local institutions have a way of hanging on in this town. If success in evolution is determined by adaptability, few cities have evolved more impressively than New Orleans. The list of obstacles reads like a category of biblical punishments. Fires. Floods. Plagues of yellow fever, cholera and malaria. Mob violence. Corruption. The slow decay of a sub-tropical climate. Institutions in New Orleans are under constant bombardment from entropy, corrupt officials, outright hostility and simple neglect. That the city still stands is a testament to its backbone, and I believe that this backbone is built around meeting places where news is exchanged, food is shared, and friends become family. The old location of Two Sisters had that kind of vibe. Walking through the doors was like walking into a family picnic where someone offered you a plate. It was the kind of place that made you feel comfortable, and I was afraid I wasn’t going to see it again. 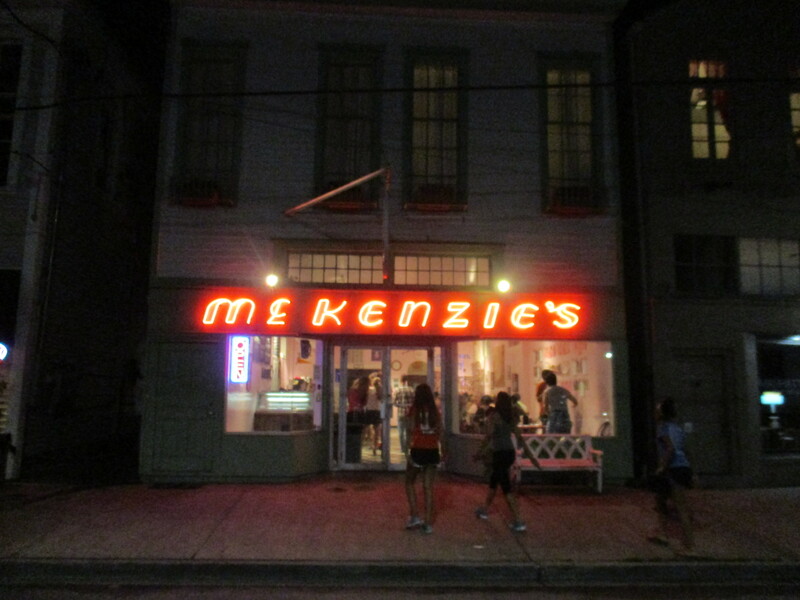 Then, on a trip out to New Orleans East, I saw the sign at the top of this post and jumped out of my seat. I don’t get out to the East a lot, and many people in New Orleans will tell you the same thing. A suburban style community developed in the 1960’s, it sits on the eastern side of the Industrial Canal and to the north of Bayou Bienvenue and the Lower Ninth Ward. Despite being one of the largest sections of the city, it’s always felt remote to me, almost another town. Part of that is probably that I didn’t own a car for so long, which makes getting out here difficult. Still, I have to confess that of all the neighborhoods that make up the city, The East is the one I know the least about. Other than some trips out to Versailles, the Vietnamese community on the far end of Chef Menteur Highway, I’m almost never out here. Smothered chicken. This is why you get over here. We pulled up to the restaurant late in the day, well past the lunch rush, but there were still a few customers making their way in. We took a seat by the window and ordered. “Is this the same place?” asked Charlie. It is, sort of. This is the second location, opened three years ago. At the moment, it’s the only location, though I’m assured by the owners that the original location on Derbigny will reopen sometime in the next year. In the meantime, there’s the food. Oh, the food. The location might have switched, but the portions haven’t. I went with smothered chicken with cabbage and rice. You know you’re in a serious restaurant when the portions are so massive that they have the bring the main and the sides on two separate, completely full plates. Because portion control is for crazy people. One thing you might not notice in that photo is the empty salad plate off to the left. Yeah, before they bring out that mountain of food, they serve you two kinds of salad: iceberg lettuce and your choice of dressing, and a scoop of potato salad right next to it. The potato salad is a highlight, with a nice punch of black pepper coming through. And the cabbage, flavored with a hamhock, is enough to put you under the table. 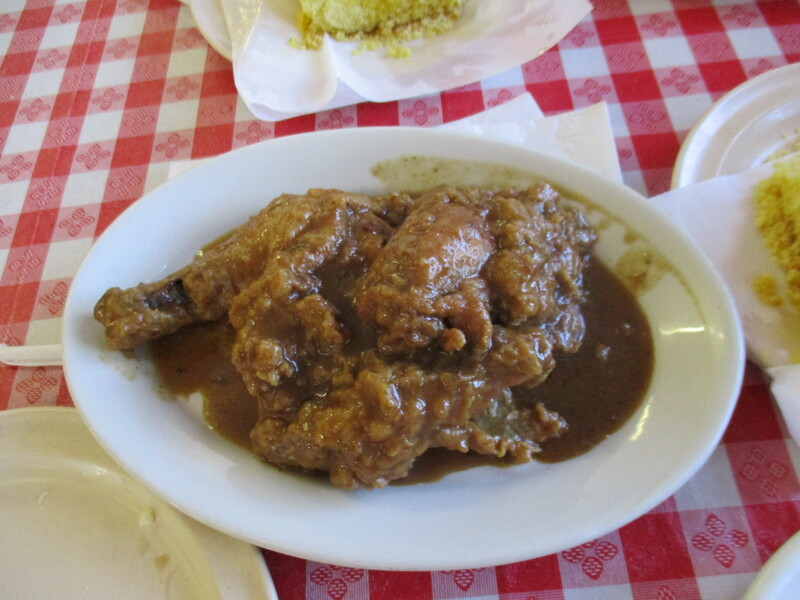 There’s also a thick slice of homemade cornbread, and then there’s your entree. Charlie went with the fried chicken and got a full plate of red beans and rice as his side. I have a hard time describing food, and frankly think that a lot of flavor descriptions border on the pornographic. So let’s just say that this food makes you feel cared for. And, if you eat the whole thing in one sitting, kinda sleepy. Charlie and his entree. He always looks that confused. 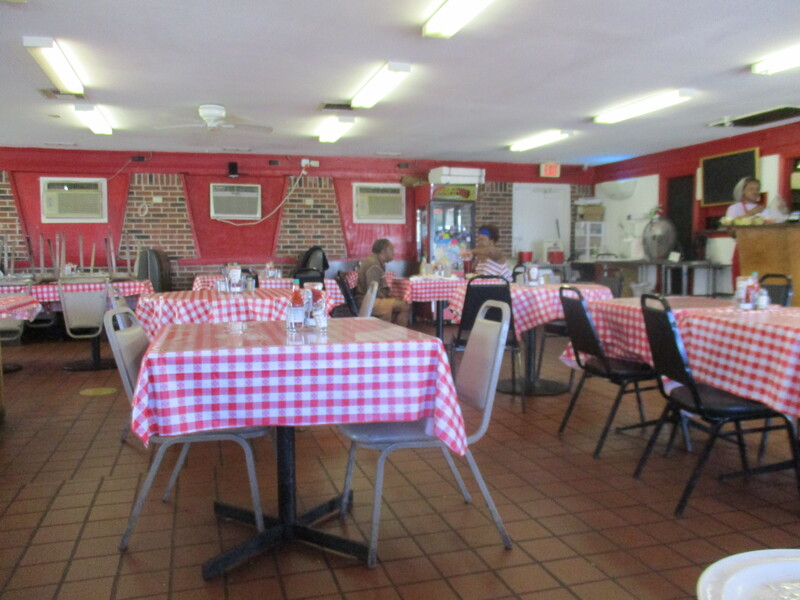 I wrote a post last week about visiting a long-time haunt in my hometown of Sarasota, how that continuity grounded me. Coming out to Two Sisters again gave me the same feeling. I discovered the original location through an NPR story shortly before I moved down to New Orleans, and it became one of my go-to places for the next few years. Clearly that story had an impact, because I can still remember the owner saying that the name of the restaurant was already in place when she bought it, but that she decided to keep the name after being assured it was good luck. Maybe it was the name that was good luck. Maybe it was just the continuity, the sense that things could change completely in this town and still remain the same. If you’re going to live in this place, you can’t afford to think any other way. 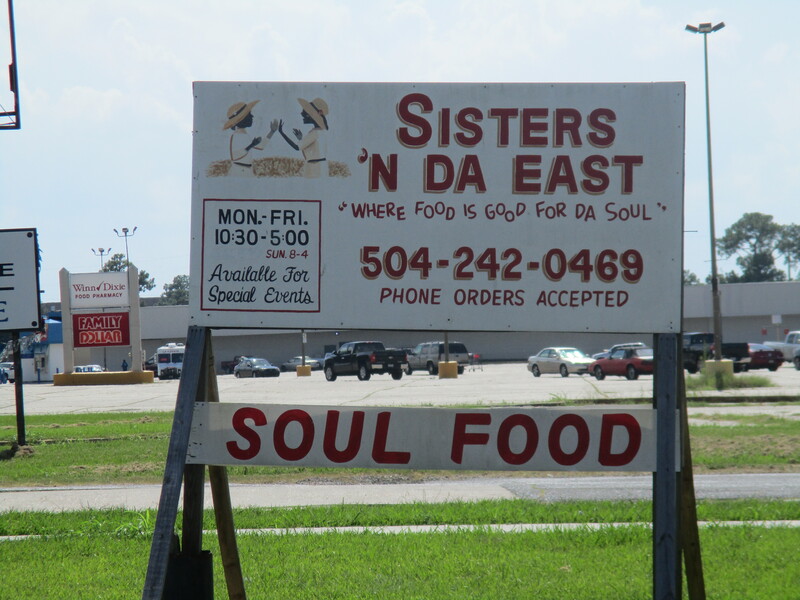 Two Sister ‘N Da East is located at 9901 Chef Menteur Highway in New Orleans East. They are open from 10:30 a.m. to 5 p.m., Monday through Friday, and from 8:00 a.m. to 4:00 p.m. on Sunday. They have a Facebook page here. Also, Irma Thomas is a regular. That fact alone should make this place a culinary destination. Charlie Halloran plays in a number of bands, including Meschiya Lake and the Little Big Horns. Go listen to them.